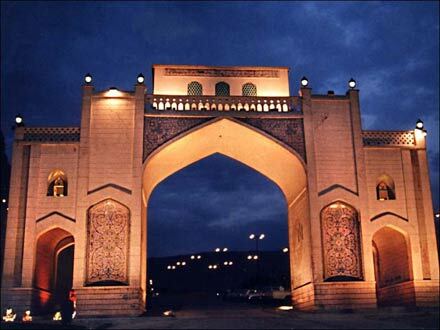 Qur’an Gate (Persian: دروازه قرآن‎‎ Darvāzeh Qur’an) is a historic gate in the north of Shiraz,Iran. The Gate was first built during the reign of Adud ad-Dawla. By the time of the Zand dynasty, it had sustained a lot of damage, so it was restored and a small room on top was added, in which were kept hand-written Qur’āns by Sultan Ibrahim Bin Shahrukh Gurekani. The two Qur’āns are known as Hifdah-Man. Travelers passing underneath the gates were believed to receive the blessing of the Holy Book as they began their trip or journey from Shiraz.